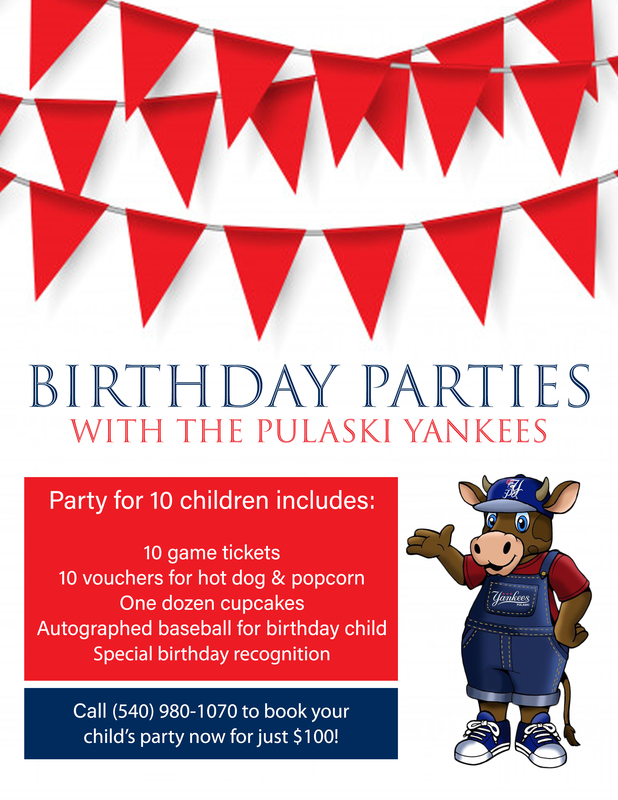 The Pulaski Yankees are proud to partner with over 200 businesses in Pulaski County and throughout the New River Valley, from small mom and pop shops to larger regional and national companies. We offer customizable packages, with no idea too big or too small for Minor League Baseball. Since 2015, over 284,000 fans have attended Pulaski Yankees games, including a league-best attendance of over 91,000 fans in 2018. The Pulaski Yankees are committed to providing a safe, fun, and friendly atmosphere in all aspects of Calfee Park. As an organization we are dedicated to the growth of our community, fan enjoyment, and opportuntities for development with our sponsors. If you are interested in discussing partnership opportunities, please contact a member of the Pulaski Yankees front office at (540) 980-1070. Click here for more information about advertising options including ballpark signage, print advertising, digital advertising, and promotional opportunities! Our new small business package is great for companies working with a tighter advertising budget! Please call (540) 980-1070 for more information.